Our first week of tot school has come to a close and I think it was a success. 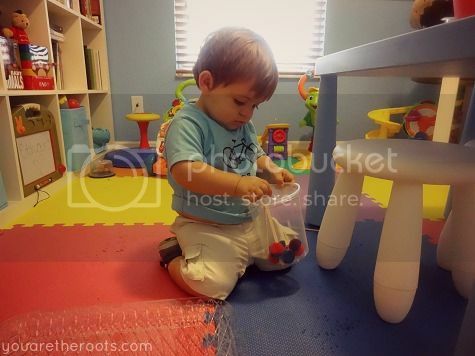 Ethan loved exploring his tot school classroom and trying out the activities. 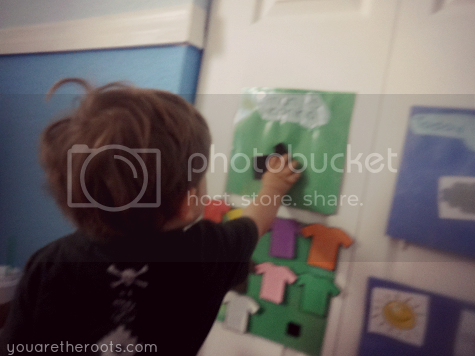 Despite him being sick, he still wanted to spend each free second in his tot school room. 1. 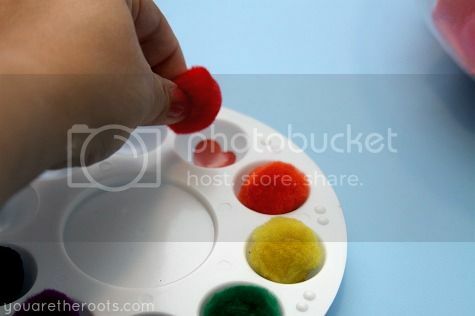 Color Sorting with Pom-Poms - I set up a plastic paint palette with different color stickers at the bottom of each well. 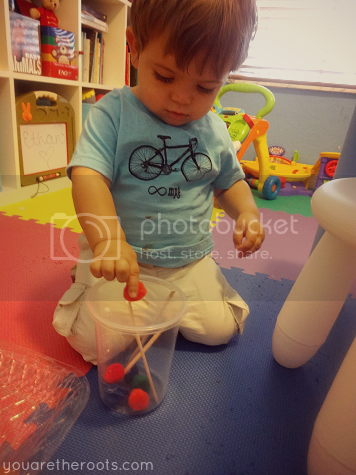 There were coordinating pom-poms that Ethan got to sort according to the sticker. 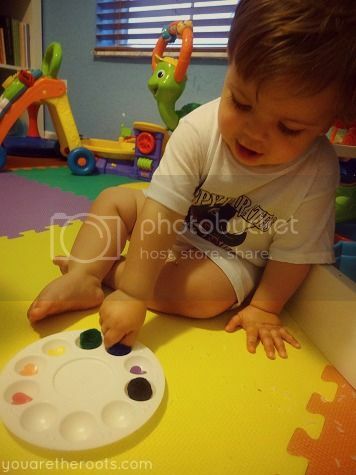 He really loved this activity, though he didn't get the color matching right on his own. He'd put the pom-poms in any random well and then start clapping and smiling. When I would point to each sticker and compare the color to the pom-poms, he would put the pom-poms in the correct place. He had (understandable) trouble with the red and orange pom-poms, however. 2. 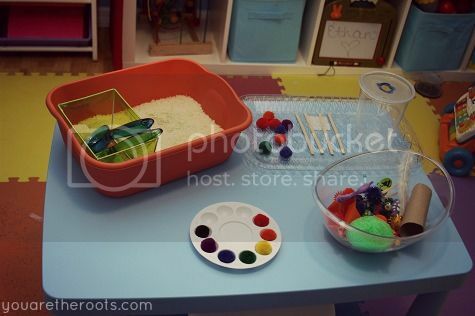 Sensory Bin - To try to ease into tot school, I thought I'd start with a fun sensory bin. It was filled with little odds and ends of different shapes, sizes, colors, textures. 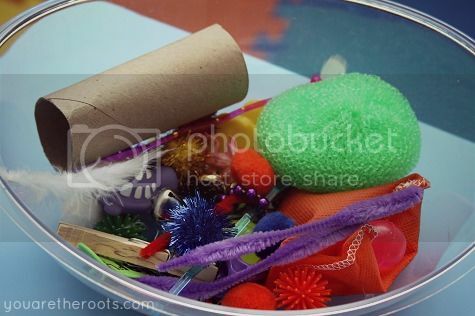 His favorite thing to do with the sensory items was to drop them each down the empty toilet paper roll. 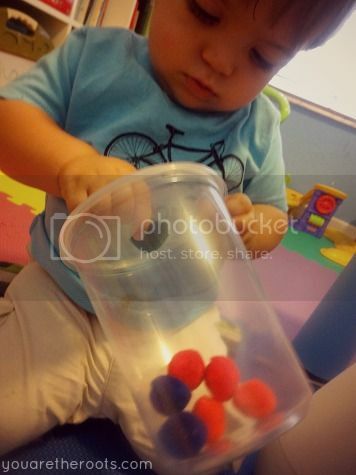 His favorite items to do this with were a bouncy ball that he loved watching bounce out of the roll and also a jingle bell that made fun sounds as it rolled out. He also loved the green scrubber sponge that I had picked up in a multi-color pack at a dollar store. He'd pretend to brush his hair with it and carried it around most of the day. It's a miracle it made it back to the tot school room at the end of the week. 3. Filling The Container - I had an empty soup container and cut a hole in the center (lined with tape due to sharp edges) and smaller slats on the sides of the lid. 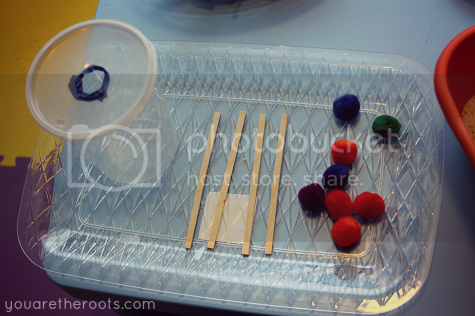 I gave Ethan a tray with some craft sticks and some pom-poms. 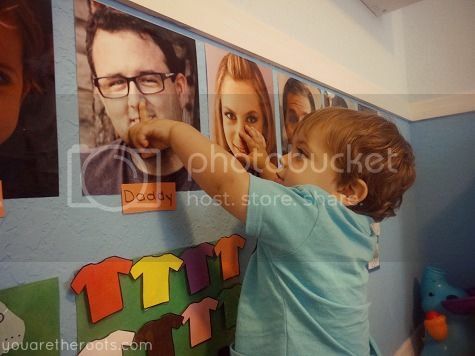 This was his favorite tot school activity of the week. 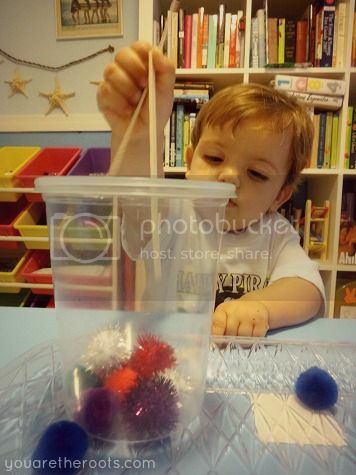 He spent close to an hour one day just pushing in all of the pom-poms and trying to figure out how to get them out. 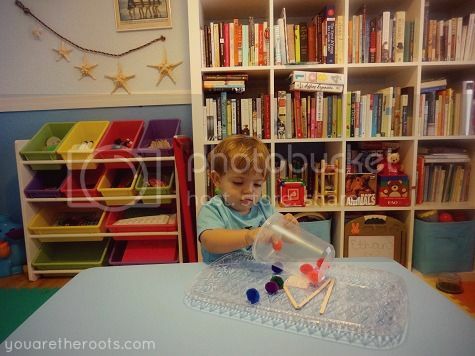 At the end of the week, he'd even try using the craft sticks (which he otherwise had no interest in) to try to lure the pom-poms back out, which was really fun to watch. 4. 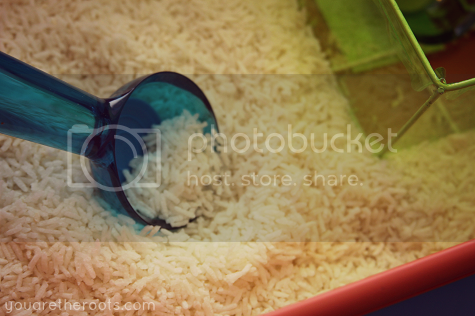 Rice Play - I set up a container with rice and a scoop and included an empty green container to scoop the rice into. 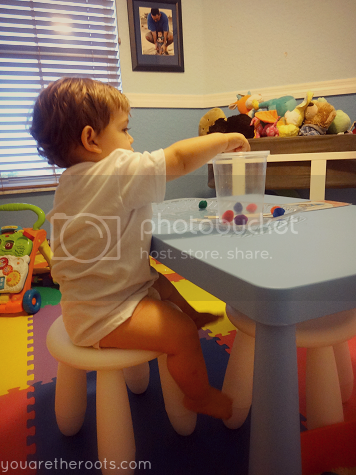 This was Ethan's absolute least favorite play activity in tot school. He liked the scoop on it's own and carried it around the room -- he even liked filling it with pom-poms -- and sometimes he liked to stir the rice a little, but that was it. He had little to no interest in the rice play. 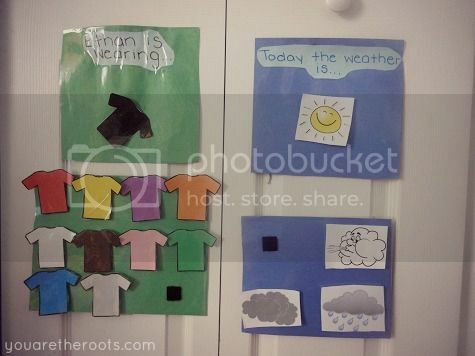 We did move our weather wall and "what is Ethan wearing" wall to the closet doors. I was having difficulty getting them to stay put on the textured walls where they were. Ethan was way more interested in comparing t-shirt colors and putting up the t-shirts onto the board than he was with choosing the weather. We're working on it. This week, we got sick before I could coordinate any good art projects. Instead, we improvised with dot paint. I printed some coloring sheets from the internet (a pumpkin and a ghost to symbolize Halloween and then a dog simply because Ethan loves dogs) and let Ethan go nuts with the dot paint. My husband let him have fun with stamps on some construction paper during the week, too. 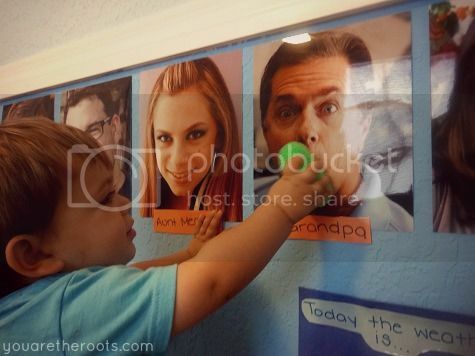 I also used some of our wall space to turn it into a gallery for our weekly art projects. Ethan has such a gigantic library of books in his bedroom that we haven't even made a dent in so this week, I let him select whatever books he wanted to read from his own library. Some of them we only read once, most we read upwards of twenty times (...literally). I am looking forward to taking him to the library once a week to pick out some new books, too, but I figured we'd start by making a dent in his own books. Ethan has recently developed an absolute love and fascination with reading, which I love. Awesome week! 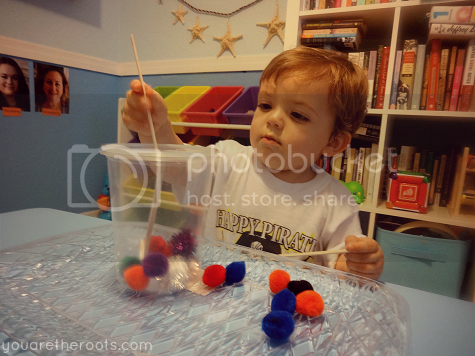 Henry lives to put Pom poms in a container. Thank you! A friend gave me a whole bunch of multicolored pouch lids so I'm excited to use those in an upcoming week activity, too! 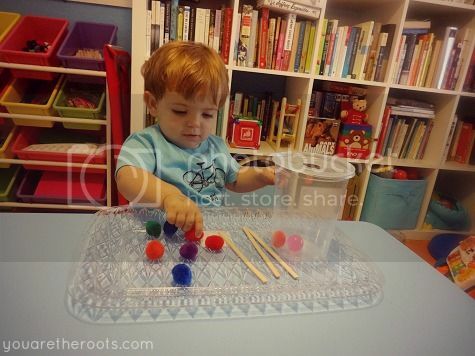 I remember how much Henry loved putting those in and out of a container! We even pulled those out again today, and he's still obsessed with them! I am really enjoying reading about what things Ethan likes/doesn't show an interest in, etc. And what a great resource you're creating with this blog for when you're able to track his progress! Thanks so much, Gena! I'm curious myself to know how his likes/dislikes will change from week to week, which is why I'm going to keep these activities in rotation, especially the ones he didn't like this past week (like rice play -- I may try that again next week!). So crazy how they grow and change so quickly! You're right, I'll give him that! Haha. I love your calendar time! Your tot school is awesome. I can't wait to add some of it to our day. Is this at your house?!? This is so cool. I am impressed and will be back for some inspiration! Yep! 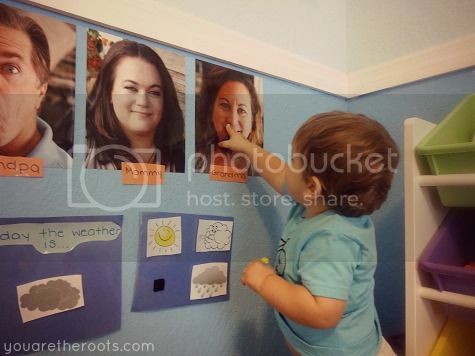 I took my former home office and converted it to a Tot School classroom/playroom for Ethan. 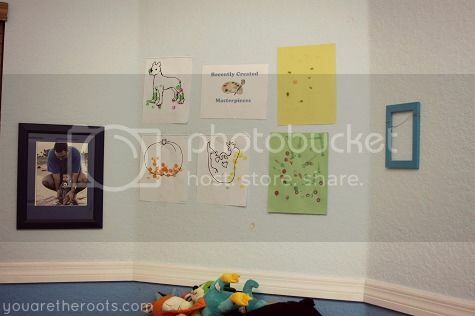 :) There's a button on the right side of my blog that says Tot School - if you click it, you can see the room transformation! 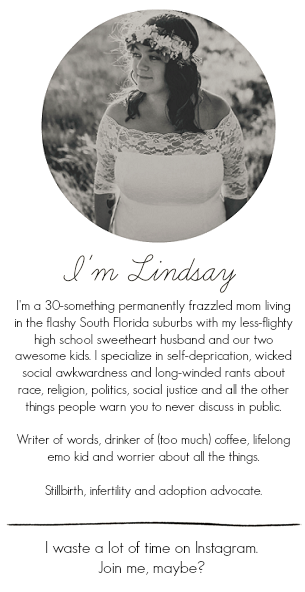 I'm the LEAST crafty person ever so I'm really proud of it, ha.